Please consider a financial contribution to the work of the committee. Donate with Paypal by clicking the button below. Encourage your group or organisation to adopt resolutions or issue public statements in support of the Seriously Free Speech Committee. Please send copies to info@seriouslyfreespeech.ca. Please ask your civil society, community or religious organisation to pass a resolution or make a public statement supporting the Seriously Free Speech Committee. Email any statements to: info@seriouslyfreespeech.ca. The Board of Directors of the Council of Canadians approved the following resolution of support for the work of the Seriously Free Speech Committee, originally submitted by the Vancouver/Burnaby chapter. The resolution includes listing the Council of Canadians as an organizational supporter, and encouraging all chapters of the Council of Canadians to consider individual support themselves. Be it further resolved that the AGM encourages members of the Council of Canadians to contact the Seriously Free Speech committee (www.seriouslyfreespeech.ca) and offer support in ways they feel appropriate. Note: Subsequently, Canwest dropped its lawsuit against Mordecai Briemberg. The lawsuit against two other defendants, Gordon Murray and Carel Moiseiwitsch, continues. The Council will send an email to Council Chapters encouraging them to express support for the Free Speech Committee and we will add the Council name to the list of organizational supporters on their website. The Near East Cultural and Educational Foundation (NECEF) is a charitable organization founded in 1984. It has two mandates. The first is education in Canada about the Middle East; the second is humanitarian aid to people in the Middle East. In carrying forward our education mandate in Canada, NECEF is very conscious of how contentious are presentations of facts and interpretations of past and present events in the Middle East. And the heat with which arguments sometimes are presented is itself another hurdle for Canadians to overcome before engaging in comparing information so as to make up their own minds on important issues. So it is indispensable for democratic political life that a variety of viewpoints be easily accessible, and that discussion of these viewpoints take place without intimidation and silencing. When Canada’s largest media conglomerate greatly narrows the expression of divergent viewpoints in its own publications and broadcasts, and beyond that attempts to intimidate and silence those with whom it disagrees, we regard this as both an attack on democratic culture and on the efforts of organizations like ours to carry forth our education mandate. But Canwest has done just that by launching a SLAPP suit against those who created and published a parody of the Vancouver Sun, a Canwest paper, and against a member of our Board of Directors, Mordecai Briemberg, whose only involvement was to hand out a few copies. The parody aimed to highlight the bias in Canwest reporting of events in Israel/Palestine. Entirely independently, NECEF had published serious research that documents the bias in Canadian newspaper reporting of child deaths in Israel/Palestine, bias that includes, but is not restricted to, Canwest publications. This perspective also finds expression in the public statements issued by the Canadian Library Association, the Quebec Ligue des droits et libertés, the president of the Canadian Labour Congress and many others, all of whom have called for Canwest, in the words of the Ligue des droits et libertés to ‘drop its unwarranted court action and to confront opposing views by engaging in public debate”. We at NECEF endorse this call. In early November Canwest finally dropped its legal suit against Mordecai Briemberg. This is a significant victory but only a first step. The Seriously Free Speech committee has organized a national and international effort, including petition and letter campaigns, a YouTube video, leafleting of public events sponsored by Canwest, public forums, and continues to garner ipport from noted personalities such as Noam Chomsky, Naomi Klein, Joy Kogawa (OC), Anton Kuerti (OC), Mel Hurtig, Ilan Pappe, Rex Weyler founder of Greenpeace, and many others. The campaign will continue until Canwest also abandons legal action against Gordon Murray and Carel Moiseiwitsch, who produced the parody in June 2007 that satirized Canwest’s well-known anti-Palestinian and pro-Israel bias. We encourage those who have worked with NECEF over many years in joint efforts for education and humanitarian aid to investigate this matter for themselves and, if they are satisfied, as we are, that democratic rights are being abused by Canwest actions, to respond similarly. More information can be found on the NECEF website (http://www.necef.org/), where there is a report by long-time NECEF Board member Mordecai Briemberg, as well as in the NECEF 2006 Report, which includes the analysis of media bias. *SLAPP stands for Strategic Lawsuit Against Public Participation. This form of litigation is frequently filed by corporations to intimidate and silence critics or opponents by burdening them with the cost of a legal defense so that they abandon their criticism or opposition. THE FEDERATION WILL support the defendants in the lawsuit filed against them by Canwest Mediaworks Publication Inc. over a parody edition of the Vancouver Sun. October 20, 2008: The media conglomerate Canwest launched a lawsuit in December, 2007, in the Supreme Court of British Columbia. Canwest is suing a handful of Vancouver activists for a four-page parody of the Canwest newspaper, The Vancouver Sun. The parody mocked Canwest’s longstanding pro-Israeli editorial position. Named originally in the suit were six John and Jane Does, and others including Mordecai Briemberg. Two additional defendants, Gordon Murray and Carel Moiseiwitsch subsequently admitted to creating the four-page parody and are now named in the suit. Mordecai Briemberg is a 69-year-old anti-war activist, who handed out copies of the parody at a bus stop, but had nothing to do with its production. Briemberg is a well-known campaigner for Palestinians’ rights, who was given a Power of Peace Award by the Vancouver YMCA earlier this year. For more information, an update and a list of organizations supporting Briemberg and co-defendants, please visit www.seriouslyfreespeech.ca. There is also an article on the Article 19 website, written by Briemberg. PEN Canada urges Canwest to withdraw this lawsuit, and accept that in a robust democracy, there must be room for parody, as a form of civil discourse, as a manifestation of our universal human right to freedom of expression. PEN works on a daily basis on the cases of writers, comedians, songwriters, who are forbidden to exercise such freedoms; look no further than the case of our Honorary Member, the Burmese poet and comedian Zargana, who is perceived as a great threat by the Myanmar regime, because he mocks the regime’s leaders and their actions. “Of course the law must accommodate commentators such as the satirist or the cartoonist who seizes on a point of view, which may be quite peripheral to the public debate, and blows it into an outlandish caricature for public edification or merriment. Their function is not so much to advance public debate as it is to exercise a democratic right to poke fun at those who huff and puff in the public arena. This is well understood by the public to be their function. “The key point is that the nature of the forum or the mode of expression is such that the audience can reasonably be expected to understand that, on the basis of the facts as stated or sufficiently indicated to them, or so generally notorious as to be understood by them, the comment is made tongue-in-cheek so as to lead them to discount its ‘sting’ accordingly. 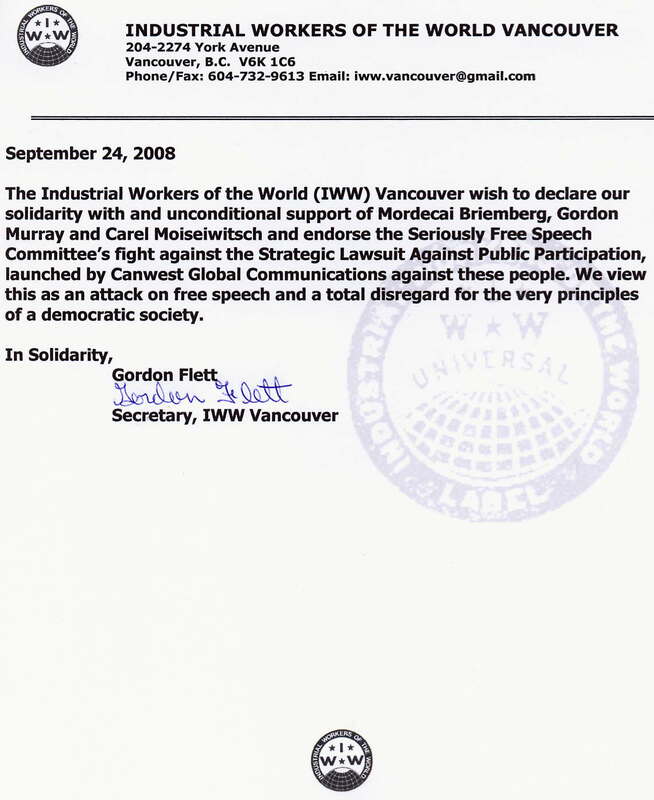 At its annual general meeting held September 17, 2008, the members of CoDevelopment Canada voted unanimously to express our disagreement with the CanWest Global Communications’ lawsuit against Mordecai Briemberg and others over a spoof of the Vancouver Sun distributed in the Lower Mainland. As an organization committed to human rights and democracy around the world, we oppose the use of intimidation to stifle the expression of dissenting views. We call on CanWest to withdraw this suit and, instead, promote the expression of different views on important issues in the pages of its newspapers. The Ligue des droits et libertés is appalled by the suit filed by Canwest against a local political activist, Mordecai Briemberg and a local publisher, Horizons Publications (as well as Horizons president Garth Leddy.). The Ligue des droits et libertés is an independent, non-partisan not-for-profit corporation that was founded in 1963. Its objectives are to defend and promote the universal and indivisible rights recognized in the International Bill of Human Rights. Freedom of expression is fundamental to democracy and the very essence of that right is to allow the expression of minority views, even when such views are perceived as offensive by the majority of the population. The spoof edition of the Vancouver Sun produced by Horizons Publication is a political satire of the paper’s position on the Israel Palestinian conflict. It is clearly meant to parody that paper’s position and no reader could possibly think that it was a Vancouver Sun publication. Under the circumstances we consider that Canwest’s suit is an attempt to crush dissenting opinion through legal proceedings by mustering Canwest’s enormous resources against an activist and a small publishing firm. This abuse of the judicial system is what is known as a Strategic Lawsuit against Public Participation (SLAPP). The purpose of such action is not to obtain justice but to use the judicial system to stifle dissent. It stifles, not only freedom of expression, but also public debate by depriving the public of an access to opposing views. These rights are fundamental to the existence of a free press and we would expect that they would be upheld rather than undermined by a media giant like Canwest. We call upon Canwest to drop its unwarranted court action and to confront opposing views by engaging in public debate. Letter to CanWest Global Communications Corp. 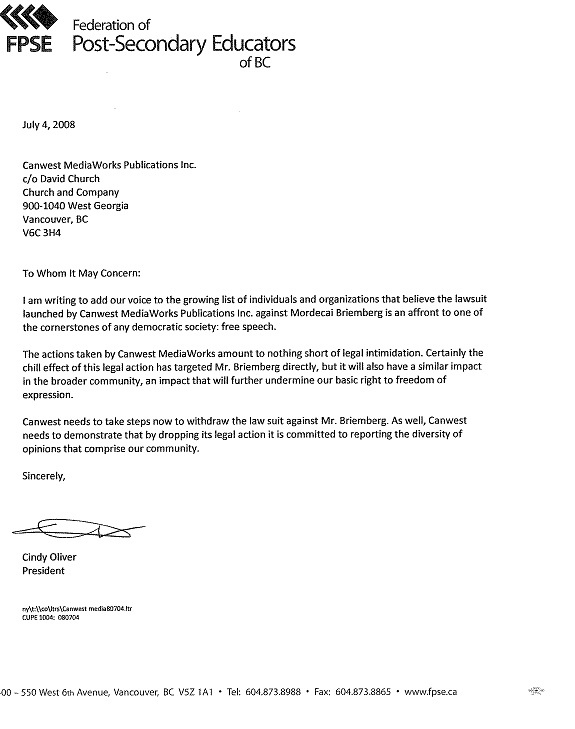 I am writing to add the voice of the Canadian Labour Congress to the many Canadians who are calling on Canwest Mediaworks Publications Inc. to end its punitive lawsuit against Mordecai Briemberg and others. What is at stake here is the right to be free from arbitrary harassment for expressing a political opinion. Canadian citizens should have the right to continue with public expression of opinions, entirely within the law, on controversial issues related to Israel/Palestine without being faced with wide-ranging. injunctions against ongoing public expression of opinions, again under the guise of a commercial case relating to trademarks. It appears that this lawsuit has more to do with suppression of free speech and debate on the Israel/Palestine issue, which is reflective of a reluctance of CanWest Global Communications Corp. and Canwest Mediaworks Publications Inc. to criticize the actions of the Israeli government. The actions of Canwest Mediaworks Publications Inc. do not, in our opinion, represent the best attributes of a free press and we strongly encourage you to withdraw the lawsuit. View a pdf of the letter from the CLA/ACB president to CanWest here. Read the resolution that the letter is based on below. six Jane and John Does named in the writ. *RATIONALE:* At its annual general meeting on *April 19, 2008*, the British Columbia Library Association (BCLA) passed a *Resolution on CanWest and Free Speech* (see next page), calling for CanWest to withdraw its legal suit against Mordecai Briemberg and the others charged with having produced a parody of The Vancouver Sun in June 2007. The Canadian Library Association/Association canadienne des bibliothèques (CLA) is Canada’s largest national and broad-based library association, representing the interests of public, academic, school and special libraries, professional librarians and library workers, and all those concerned about enhancing the quality of life of Canadians through equitable access to information, lifelong learning, and literacy. CLA is an advocate and public voice, educator and network for the Canadian information professions. CLA believes that libraries and the principles of intellectual freedom and free universal access to information are key components of an open and democratic society. Effective advocacy is based upon understanding the social, cultural, political and historical contexts in which libraries and information services function. Intellectual freedom is a core value of Canadian (and global) librarianship and its sister profession of journalism. The role of the media in a democracy is to provide a forum for robust open discussion, dialogue, and debate, not to suppress freedom of expression. CLA should challenge CanWest’s seeking to use its corporate resources and cultural capital to intimidate its dissenters and silence those people and groups who hold opposing views. With this Resolution, CLA has the opportunity to strongly assert that satire and parody are important intellectual traditions and “ways of knowing” that must be honoured in democratic society. The coordination committee of the “Social Forum network of Quebec City” has decided to offer its moral support to the Vancouver Seriously Free Speech. We a progressive network of over 40 groups and networks: environmental, international solidarity, student, trade unions, etc. For more information click here. The following motion was passed by the BCTF table officiers on May 15, 2008. Parodies of newspapers have a long history of being used to draw attention to the nature of coverage and perspectives in newspapers. In BC and Canada there are few newspapers that are not owned by CANWEST where one could raise concerns about the biased perspectives and present alternative views. CANWEST is using its corporate wealth to afford legal suits that make it difficult for those presenting alternative views. They have brought suits against the Tyee and now against Mordecai Briemberg. A defence committee called the Seriously Free Speech Committee has been established to resist this CANWEST attack on freedom of speech. Honorary members of the defence committee include Barry O’Neill, President of CUPE BC, George Heyman, President of the BCGEU, Bill Saunders, President of the Vancouver and District Labour Council, Noam Chomsky, Naomi Klein, Libby Davies, Bill Siksay and many other progressive people. “Satire and irony are important tools in the arsenal of journalists and artists. The contentious issues related to the rights and actions of both Israelis and Palestinians, just like other contentious issues of public interest, require open discussion, one that encompasses a broad spectrum of differing perspectives. Any attempt to silence — by harassment, intimidation or censorship — the voices of those with whom one disagrees is anti-democratic and unacceptable. This is especially true when a large media corporation does the silencing. The vote of the union executive was unanimous. We represent most newspaper workers in B.C. including journalists and all other workers at the Vancouver Sun and Province and many of the smaller Canwest-owned community newspapers. It’s time to drop your suit against Mordecai Briemberg, Horizon Publications and Garth Leddy. On December 7, 2007, CanWest lawyers filed a writ of summons in the Supreme Court of British Columbia, initiating legal action against a local political activist, Mordecai Briemberg and a local publisher, Horizons Publications (as well as Horizons president Garth Leddy.) At issue is a satirical paper printed and distributed in the Lower Mainland last June, a paper which parodied the layout and look of the Vancouver Sun while mocking the papers perceived bias in favour of the state of Israel and against Palestinians. Like other spoof editions of mainstream newspapers that have circulated within our community in years past, the pseudo-Sun poked vigorous fun at its satirical target, exaggerating and mocking CanWest editorial and news practices that some observers view as unfairly tilted in a pro-Israel direction. However, it is hard to imagine any reasonable reader being confused into thinking she had a copy of the legitimate CanWest Vancouver Sun in hand, given the appearance in the parody of obviously satiric bylines such as “P. Rupa Ghanda” and “Cyn Shorsheep” coupled with story headlines such as “Study Shows Truth Biased against Israel.” If any doubt remained, the clear identification of the distributed material in a boxed item that asked “Who Produced this Vancouver Sun Parody and Why?” identifying it as a product of a group calling itself the “Palestine Media Collective” ought to have made abundantly clear that this was not a Vancouver Sun publication. Nevertheless, CanWests statement of claim not only characterizes the motivation of those who published and distributed the fake newspaper as malicious; it suggests that the Suns trademark has been infringed by its use in the satirical paper. Some people, it would appear, just can’t take a joke. We call upon CanWest to exercise a bit of good humor and sober second thought, which will, we are confident, persuade the firm that it does not want to proceed in an action that will, if successful, look like corporate bullying. Whether successful or not, the case works against the principles of press freedom that support CanWests media operations across Canada. Too often, the mere threat of court action is enough to stifle public debate or satirical expression. We all have bad days in which we lose our sense of humor and over-react to perceived slights, and no one can be surprised that the arrival of an irreverent parody of one of the firms flagship papers last summer was viewed in CanWest offices as bad news indeed. Nevertheless, two of the hallmarks of personal and corporate maturity, we would submit, are a sense of humor that permits self-reflective laughter and the serene self-confidence that trumps the impulse to punish those who laugh at us. For the sake of its own good name and repute, and for the sake of our cherished Canadian traditions of press freedom, we urge CanWest to drop its court action and get back to the business of exercising press freedom, not attacking it. At its annual general meeting on April 19, 2008, the British Columbia Library Association passed the attached resolution [see below] calling for CanWest to withdraw its legal suit against Mordecai Briemberg and the others charged with having produced a parody of The Vancouver Sun in June 2007. The British Columbia Library Association is a non-profit, independent, voluntary association established in 1911. Our nearly 850 members include librarians, library personnel, library trustees and other interested individuals; corporate, government, school and academic libraries; publishers, and library supply companies. Intellectual freedom is a central tenet of librarianship; librarians have fought for generations for freedom of expression and access to information. Journalism, at its best, shares a commitment to these principles. The role of the media in a democracy is to provide a forum for open discussion and debate, not to stifle dissent. We are therefore especially disappointed that CanWest has sought to use its corporate resources to intimidate its critics and silence those with political positions different from its own. Satire and parody have important intellectual traditions. Well-known satirists include Aristophanes, Horace, Chaucer, Jonathan Swift, Daniel Defoe, and Mark Twain – all people who were able to use hyperbole and humour to make their points without being sued by the objects of their parodies. CanWest’s suit is an attack on a crucial tool of free expression and threatens to have having a chilling effect on public discourse. We urge CanWest to drop its suit against Mordecai Briemberg and the six Jane and John Does named in your writ. The free exchange of ideas (including ideas with which we may disagree) is a critical component of a democratic society, and ought not to be undermined by the very institutions that make such exchange possible. BECAUSE the Seriously free Speech Committee was recently formed to defend Mordecal Briemberg against this corporate attack and to uphold the right of free speech and parody in Canada. 4) submit this resolution as an emergency resolution to the Canadian Labour Congress Convention. As president of the BC Freedom of Information and Privacy Association, I would like to add my organization’s support to Dr. Mordecai Briemberg. The use of a SLAPP suit by CanWest in an attempt to stifle free speech must be opposed. Free speech must be preserved in Canada. Seriously Free Speech – Vancouver Monthly Meeting of the Religious Society of Friends (Quakers) endorses the Seriously Free Speech Committee’s petition against the Strategic Law Suit Against Public Participation filed in court by Canwest against Mordecai Briemberg for passing on copies of a parody of The Vancouver Sun. We feel that this is infringement on freedom of speech and misuse of power. President and CEO of CanWest Global Communications Corp. I am writing to express my opposition to Canwest’s lawsuit against political activists over a June, 2007 parody of The Vancouver Sun. The parody satirized the well-documented pro-Israel bias of Canwest’s coverage of the Middle East. Judging by the original writ of summons, Canwest launched its SLAPP suit against Mordecai Briemberg with no evidence of his involvement beyond his support for Palestinian human rights. Gordon Murray and Carel Moiseiwitsch have since taken responsibility for producing the parody, stating that it was intended to point out Canwest’s biased reporting about Israel and Palestine. This lawsuit reveals Canwest’s willingness to use its media outlets and its economic strength to throttle political debate on the Middle East. This is not a trademark issue but rather an attack on free speech and the right to produce parody. I support the defendants and the right to use parody and satire in the public arena. I am asking you to withdraw this unjust lawsuit which says more about Canwest than the defendants. No offense intended here folks but as the kittehs say, “YR doin it WRong”. Check out the Viacom vs. YouTube fight. Viacom backed down within weeks and pulled out of court, even though the judge found *for* them. This was done by boycotting both Viacom and its advertisers. Anonymous backed off the Church of Scientology from using DMCA [Tom Cruise video] and supposedly “terrorist” legislation against the right to speak out. CoS countered by buying advertising. Anonymous came back with massive uploading of anti-CoS videos and street protests. This fight has been going on all over the intertubes. Has everyone in Canada been sleeping? Get the general libertarian free speech netmongers in on the fight. Call for a CanWest AND its’ advertisers’ boycott. My problem with this isn’t whether it’s Palestine vs. Israel and the media bias. Parody is a political statement and cannot be shut down just because CanWest doesn’t like a different viewpoint. I’m off to prepare video for this fight and I will see that a copy goes to Rabble. You are more than welcome to add it [Creative Commons licensing] if you like. Briemberg. Its a move to curb free speech in Canada. Parody is an important and crucial tool of free speech. You bludgeon your own reputation by pursuing this lawsuit! Shame on you. I am a reluctant subscriber to CanWest newspapers, the Edmonton Journal until recently and now the Victoria Times Colonist. I strongly oppose the editorial policies of CanWest to give unqualified support to the criminal action of Israel in occupied Palestine. I demand that you stop your SLAPP suit against two individuals who parodied this support. I will gladly give up my subscription if this suit continues and I will encourage others to do so. Briemberg. It is a move to curb free speech in Canada. We must stop all those who seek to curb free speech, as they do so that they may profit from our ignorance.